We grow alpines, heathers and dwarf conifers which are all suitable for borders and containers. We have a large range of herbaceous Perennials and hostas, over 150 varieties stocked, many of them unusual. 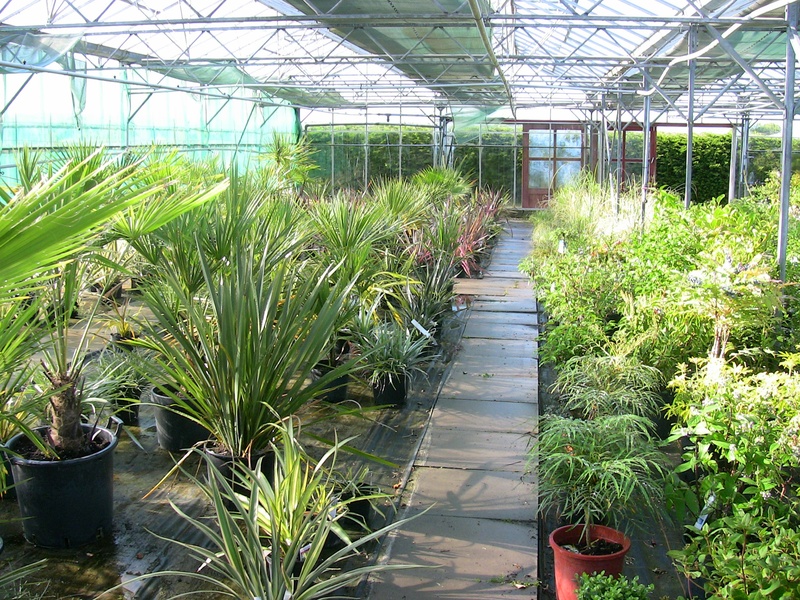 Grasses and bamboos, exotics including phormiums & palm trees, plus ferns are all available. Climbers include wisteria, clematis, honeysuckle and jasmine, amongst others. Bush & Climbing Roses including David Austin varieties are in stock from February onwards. We have miniature roses, shrub roses, hybrid teas and floribundas, as well as a range of 'gift roses' which include 'Golden Wedding' 'Thinking of You' and more. We always have a wide selection of herbs in spring, summer and autumn, lots of different varieties as well as the popular culinary herbs. Lavender includes blue, white and pink varieties of English lavender, plus different types of French lavender. We grow a huge range of shrubs, with many unusual varieties alongside the more common species. We keep them in various sizes so customers can choose the 'instant effect' or smaller plants to grow on themselves. A wide range of Japanese Acers is always in stock, including the prostrate forms such as 'Garnet' as well as more upright varieties like 'Orange Dream' and 'Shaina'. Hedging plants include leylandii, laurel and privet, and quickthorn is available in the winter. Ornamental trees are stocked, over 60 different varieties including mountain ash, flowering cherry, crab apple, plus more unusual species. 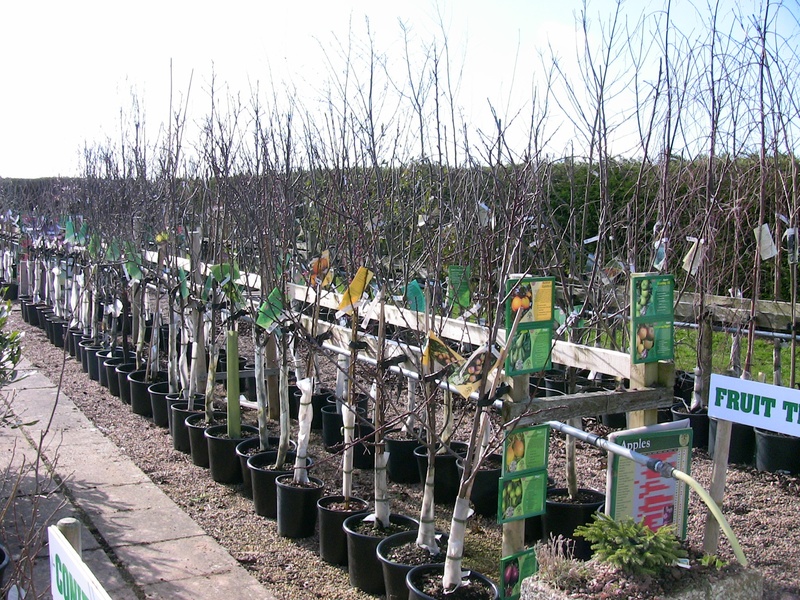 We have a large range of fruit trees including apples, pears, cherries, plums, damsons and gages. Our trees are grown in the Vale of Evesham, and supplied to us as one or two year old specimens. They come with little books showing how to plant, prune and maintain. We stock a range of soft fruit, raspberry canes, gooseberries, black and red currants. We are now stocking a range of seed potatoes, onion and shallot sets, plus dahlia, lily and canna tubers. 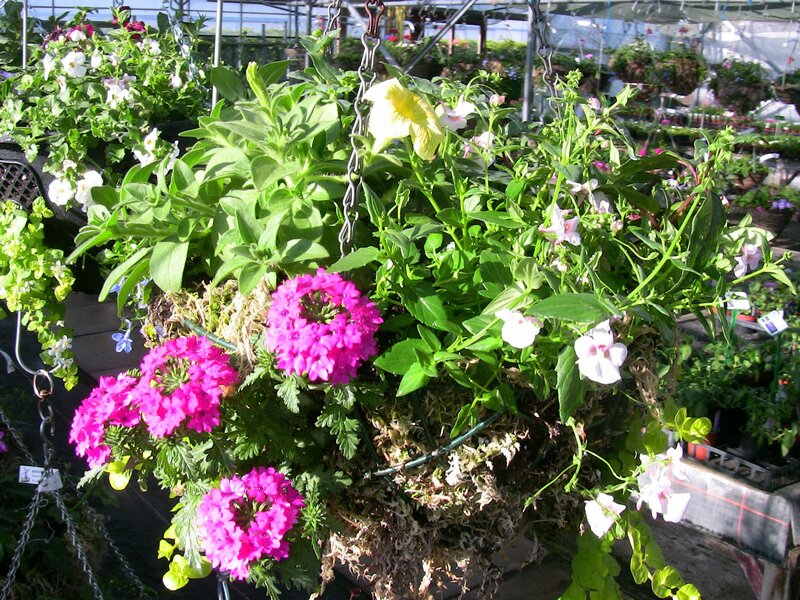 We grow a huge selection of plants for summer hanging baskets and tubs, including Surfinia, Geraniums and Fuchsia, Begonia, Lobelia, Verbena and many more. We also stock 'baby bedding' a range of plug plants which are ideal for customers wishing to 'grow their own' bedding. These should be ready late February/early March. Winter bedding includes pansies, violas, trailing pansies, ivy, small shrubs, cyclamen and wallflowers. Our pansies and violas are separate colours, not mixed trays. We have a selection of cacti and succulents for sale in the summer and autumn months, in various sizes. Vegetable plants will be in stock from late February onwards, depending on variety. Species not available till late March/early April include tomatoes, cucumbers and courgettes, salad and chilli peppers, pumpkins and butternut squash.